was a chess playing entity based on a Myrinet computer cluster consisting of FPGAs and x86 PCs. Hydra was the continuous development of the ChessBase funded FPGA project called Brutus by Chrilly Donninger et al. now under the patronage of the Pal Group of Companies  and Sheikh Tahnoun Bin Zayed Al Nahyan    of Abu Dhabi, United Arab Emirates. Hydra had its tournament debut at the IPCCC 2004 winning clearly with 6½/7 ahead of Fritz and Shredder. Soon later, at the ICT 2004, Hydra came in behind Shredder, but taking revanche in August 2004, winning a match with 6½-2½. Also the IPCCC 2005 was dominated with 8/9, a half point ahead of Shredder. 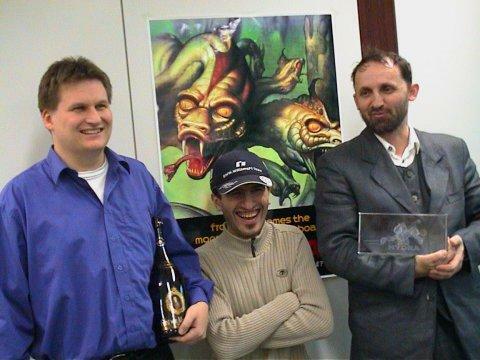 Hydra also achieved strong results versus humans, playing two times the Man vs Machine Team Championship, and in 2005 versus Michael Adams winning decisively with 6½-½. The chess monster further played freestyle matches along with its sponsor, chess lover and chess player under the pseudonym Zorchamp , and was active on the Playchess server - its last game in June 2006 . In June 2009, Hydra book author Christopher Lutz stated that "unfortunately the Hydra project is discontinued." The sponsors decided to end the project . 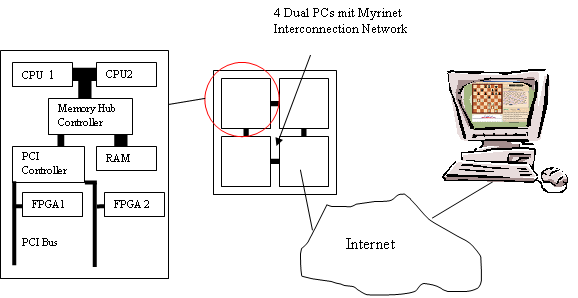 Hydra  ran on a Myrinet interconnected Linux cluster of four (later eight) dual PC server nodes able to handle two PCI buses, which are conneced to a FPGA card each, simultaneously. The distributed search algorithm ran on the x86 nodes as MPI processes, where the last three plies of an n-ply search including quiescence and all evaluations are delegated to the FPGA card, typically 100.000 times per second and processor. For further information see the description of Brutus. Sajeer Mohammed - "Mr. Parallel"
Cryptic runs on modern high speed multi-processor CPU. It is programmed in mixed C and Assembly Language. It is aimed to be the world's top single machine Chess Engine. Shark is network based deep search meta engine. It is based on unique idea by which it reaches to depth of 25+ easily with the help of only 6 CPUs in less than a minute. Currently a dual core CPU takes more than an hour to reach to this depth. Another program by Donninger and Alex Kure was also named Hydra and played the 15th World Microcomputer Chess Championship in Paris 1997. With the help of the FPGA technology, the boarder between hard- and software has vanished. It is now possible to develop complex designs and fine grained parallel applications without the long-lasting chip design cycles. Additionally, it has become easier to write coarse grained parallel applications with the help of message passing libraries like MPI. The chess program Hydra is a high level hardware-software co-design application which profits from both worlds. We describe the design philosophy, general architecture and performance of Hydra. The time critical part of the search tree, near the leaves, is explored with the help of fine grain parallelism of FPGA cards. For nodes near the root, the search algorithm runs distributed on a cluster of conventional processors. A nice detail is that the FPGA cards allow the implementation of sophisticated chess knowledge without decreasing the computational speed. This page was last edited on 18 October 2018, at 11:53.